Don't let mail take over your home. Set up a system for managing mail and commit to staying on top of it as soon as it arrives to prevent the paper trail from covering your home's every surface. And you'll save valuable time, too! Designate an area of the home where you or other family members will sort through the days mail. You may choose to use the family bill paying desk, a side table near the main entryway or an area on your kitchen counter. There should be sufficient space to shuffle and sort through items. You may want to incorporate a reusable calendar to notate important dates. Its also helpful to have a letter opener, scissors, wastebasket, recycling bin and personal shredder nearby. Once you know where the task will take place, you need to create a storage system to organize the paperwork and keep the area tidy. Setting up three basic categories: "To Pay," "To Review/Act On" and "To File" generally works for most families. In addition, some households create a space for each family member to contain personal correspondence or miscellaneous items that that person is responsible for reviewing. Depending on the space, you may select letter trays, storage boxes, wall-mounted organizers or desktop filing solutions to create your categories. You'll want to be sure they are clearly labeled with your categories. Choose solutions that will look nice in your space with coordinating colors and materials. As soon as you enter your home, plan to open the mail. After opening an envelope, decide under which category the mail should go: is it a bill that needs to be paid? Put it in the "To Pay" file and mark the due date on the calendar. Keep bills in their original envelopes until they are paid to keep loose items together. Is it a bank statement that you need to reconcile or other document that you take some action on? If you cannot take care of it immediately, it goes in the "To Review/Act On" file you should set a specific date and time each week to review the contents of that file. Use the calendar if you need a visual reminder of when you need to do something by. Sometimes you'll receive items in the mail that you will need to hang on to for future reference: tax statements, receipts, etc. These go in the "To File" category. This category should be checked weekly and items placed into a filing solution. You may also put coupons and special offers in the "To File" category. However if your family receives and uses mailed coupons for restaurants and services frequently, you can set up another category in your filing system specifically for these types of things. Go through circulars as soon as they arrive and clip and save the coupons your family will use, rather than filing the entire thing. Make it a habit to evaluate the contents of the mail as soon as you return home in the evening. Don't be tempted to dump the pile of envelopes on your mail counter and return to it later. By reacting swiftly to paperwork as it enters your home, you reduce the chance of misplacing an important item or missing a critical deadline. 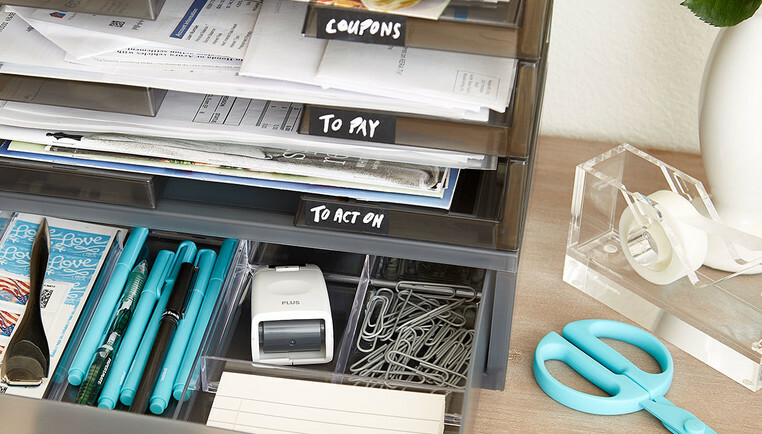 You can also reduce the visual clutter that comes along with big piles of papers.